Whether you’re just starting out or you’ve been crocheting for years, it’s always good to make sure you’re using equipment that suits you and makes crocheting as great as it can be. I’ve put together a list of all my favorite crochet tools to help make sense of all the products out there. I always link the specific tools I use for my patterns in the materials section of the pattern, but here I have some of my absolute favorite crochet tools. Btw, this post contains affiliate links to products I use and LOVE. Click here to read my full disclosure policy. 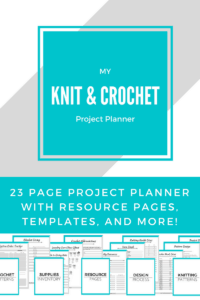 I have a lot of crochet and knitting supplies, so I’ve narrowed this list down to just the things I believe every crocheter needs to have. These are my favorite must-have tools and all of them are easy to find and affordable. For beginners, I think it’s best to start out with simple crochet tools that work and don’t set you back too much because crochet is meant to be fun and relaxing. If you want to take a look at everything I use, including knitting supplies, yarns, and even the camera I take product pictures with, check out my Amazon list here. I always update this with new finds! To begin crocheting, you’re going to need crochet hooks. I love the Rainbow Crochet Hook Set from KnitPicks. I love the soft cushioned grip on these and I reach for these every day. I’ve had mine for a while and I did a full review in this post. for $15, you get all the sizes you need in a convenient case. Update: I still love my Knit Picks hooks but after over a year and a half of hard use, I upgraded to another set. I still use these hooks, but I also purchased the Clover Amour Hooks to replace some of the more worn out ones. The Clover set is amazing and has some in-between sizes that the Knit Picks set doesn’t have. It’s a little pricier at $35, but the quality is worth it if you can get them. Learning to crochet is easiest when you have thick yarn that is “beginner friendly”. Basically, you want yarn that you can work and rework without the yarn getting really fuzzy and tangled. You want something thick enough that it’s easy to see what you’re doing. For me, that means bulky or super bulky acrylic yarn. I like using the Bernat Softee Chunky Yarn when I’m teaching, and you’ll see it a lot in my tutorials. It’s easy to see what you’re doing and you can work with it pretty aggressively as you learn. You can get these at Joann Fabrics, but any thick acrylic yarn will do! Need help picking out yarn? Here are my favorite yarns for different projects and a guide to reading yarn labels. Invest in a really good quality tape measure because you will need it, and you’ll be using it all the time! My favorite tape measure is this one from Knit Happy. Now, I know you can get tape measures for cheaper at local craft stores, but they aren’t as smooth and durable as this one. I bought mine years ago and it’s still like new. The cheap craft store ones break or get stuck in a matter of months. This one is just a little bit more but lasts much longer. In order to sew your crocheted pieces together, you’ll need a needle with an eye big enough for yarn. I like the Clover Chibi Needles. These 3 needles come in a little storage tube so you never misplace them. I have these in the regular size and the jumbo ones for jumbo yarn! Get yourself some good scissors (no cheap scissors or your kids’ safety scissors!). This is probably my most important crochet tool after the hooks, and I can’t stress it enough. Buy some good fabric scissors or embroidery scissors and use them ONLY for your yarn. As long as you don’t use these scissors for anything else, they’ll stay sharp and clean, perfect for cutting yarn. I use these, in purple. And those are my favorite crochet tools! Having the right crochet tools is important, but as you can tell by this list, it doesn’t have to be expensive. Most of the items are less than $10. The crochet hooks are the most expensive, but you will use them so much, it’s worth it. If you spend the time and money to get the right materials and crochet tools early on, you can hit the ground running with products you’ll love from the beginning. If you’re new to crochet and just starting out, be sure to check out my Crochet 101 Series for simple lessons and tutorials to guide you through the basics. 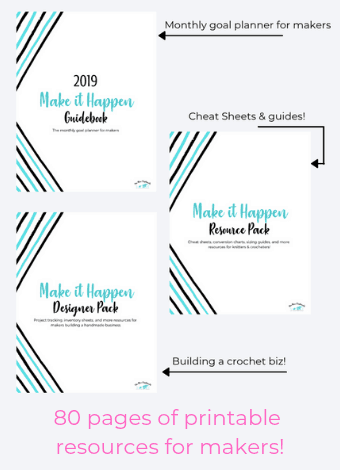 I also have a free ebook with the same lessons PLUS 12 free patterns designed for beginners and helpful tips and resources. 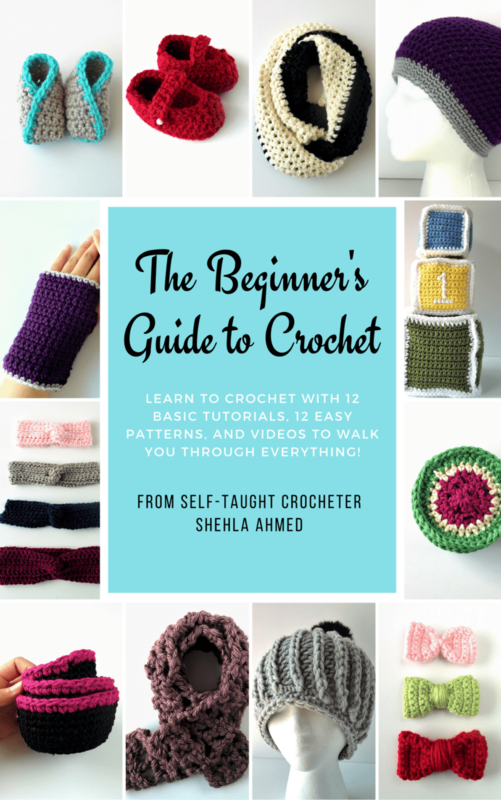 It’s called The Beginner’s Guide to Crochet and you can get for free by clicking the image above! Are the KnitPicks hooks steel or aluminum? They look like a great set, but I do a lot of very tight stitching for several projects and aluminum hooks just don’t stand up very long. Thanks for the post. They’re aluminum. I know that Clover hooks are great, although I’ve only used one myself, but they have the Amour line which are steel (http://amzn.to/2ns463J).